Our development will be sustainable if the world’s Biodiversity is conserved, something which has been completely ignored all over the world. This is what governments, politicians, industrialists, indeed, all of us urgently need to understand. However, unless this is properly explained to everyone, using well-presented radio and TV programmes and only if the importance of protecting the environment is taught in schools, in an attractive and compelling way, the conservation of all living things will be neglected and Biodiversity will continue, ever more rapidly, to decay. It is absolutely vital that we all realise that without Biodiversity we cannot survive, and that an increase in Biodiversity will increase the chances of our species to survive. The other species which inhabit our planet are not only the source of our food: but also the source of our medicines (about 80% of all medical drugs are extracted from plants and 90% are of biological origin); clothing (practically everything that we wear is of animal or plant origin); energy (wood, oil, waxes, resin etc. ); for most of the construction materials and furniture; and so on. Even a great part of electric energy that we use would not be possible without the contribution of other living things since, even though electric energy can be produced by waterpower, the water still has to run through hydroelectric turbines, and these in their turn need lubricant oils; such oils are extracted from crude petroleum, which is originally of biological origin. And yet, instead of conserving Biodiversity, we have contributed to its drastic decay. In the past we used about 10,000 plant species in our diet, however, today people´s eating habits in industrialised countries are based on about 20 plant species, among which eight species are cereals (maize, millet, rice, wheat, rye, barley, oats and sorghum) and meat with only five species of animals (pork, chicken, beef, lamb and goat) commonly eaten. Even during my long life-time (yet still extremely short compared to the age of the earth), a great number of species have vanished, both animal species as, for instance, the Mariannas mallard (Ana oustaleti), considered extinct in 1981, and the Caribbean monk seal (Monachus tropicalis), considered extinct in 2008, and plant species, as for example the Indian holly (Ilex gardneriana), considered extinct in 1998, and Armeria arcuata, from the southern Coast of Portugal, which has not been seen for over a century. From other phyla there is the quinine fungus (Fomes officinalis), which although in fact containing no quinine, and despite being one of the longest lived mushrooms (living on average for 50 years), is extinct in Europe, due to excessive exploitation for its medical properties, and now occurring only in North America. 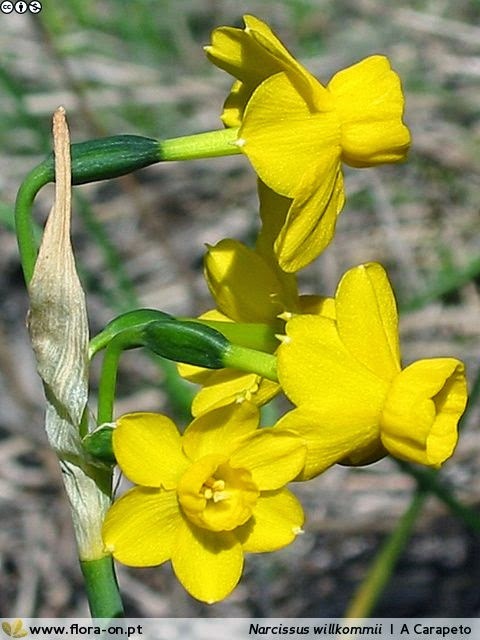 Particularly vulnerable are the endemic species with a very restricted distribution as, for instance, the Iberian endemic Narcissus willkommii, considered extinct in Portugal but, fortunately, rediscovered in relictual populations in the Algarve, as well as the Portuguese endemics Narcissus scaberulus and Narcissus calcicola.